The morning of Sunday 18 October 2009 heralded the Hindu New Year, Samvat 2066. From early morning, devotees and families arrived at BAPS Shri Swaminarayan Mandir in Neasden, London, to offer their prayers on the first day of the New Year. Before their arrival, volunteers had been working through the night to ensure that visitors would have a smooth, pleasant and safe experience. The first prayers of the morning were dedicated to world peace and stability held inside the assembly hall. 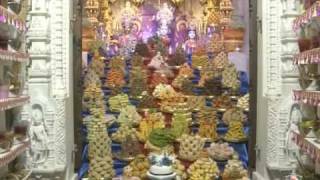 The Annakut – the ceremonial offering of food to the Deities – followed at midday, first in the sanctum in the main mandir and then in the Haveli assembly hall. 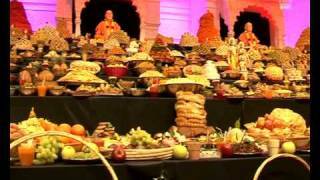 More than 1,200 sumptuous dishes of sweets, savouries, curries, pickles, salads, desserts, soups, juices, and various other items representing cuisine from around the world had been lovingly and artistically arranged before the Deities. The Annakut is a devout offering of the first meal of the New Year in thanksgiving to God for His providence over the past year and to seek His blessings for the year ahead. Throughout the day, visitors feasted their eyes on the wondrous assortment of shapes, colours and food designs, and allowed their noses to sway to the medley of aromas that wafted through the air from the blend of charismatic Indian spices. This year, the New Year celebrations conveyed the theme of the universal values associated with Diwali, such as family unity, serving society, and caring for the world. Such values have been enshrined in the Hindu scriptures and practised by great people of the world. Informative displays inside the Haveli helped visitors reflect upon the deeper meaning of Diwali. There was also an educational journey through the history and significance of the ‘5 Days of Diwali’ through specially designed panels. A number of dignitaries joined the devotees throughout the day to participate in the half-hourly arti ceremonies and to pass on their New Year’s greetings. These included: Syed Asif Ibrahim (Minister Coordination of the High Commission of India), Dawn Butler MP (Brent South) and Sarah Teather MP (Brent East). Earlier in the day, His Holiness Pramukh Swami Maharaj had sent his personal blessings from Gondal, India, to all the devotees and visitors. He said that he was also praying for the health and well-being of all people in the UK, and for the light and warmth of God to guide everyone to better times.